Ambulatory surgery has a target of rapid recovery and discharge. Esmolol has sparing effects on inhalational anesthetics and opioids. The aim of the study was to demonstrate effects of esmolol infusion on recovery profile and discharge from postanesthesia care unit (PACU). This study was a randomized, double-blind, and controlled study. Sixty female patients scheduled for elective gynecologic laparoscopic surgery under general anesthesia were divided into two groups. Patients were given either esmolol loading and maintenance doses (the esmolol group) or equivalent volume of normal saline (the control group). Esmolol was given as a loading dose of 1 mg/kg just before induction of anesthesia followed by an infusion of 30 mg/kg/min. Depth of anesthesia was controlled by bispectral index monitoring and variable dose propofol infusion, whereas fentanyl and sevoflurane doses were fixed throughout the procedure. Times denoting recovery from anesthesia were recorded. Patients who reached White-Song score of 12 plus pain numerical rating scale below 4 were discharged from PACU. Time needed for PACU discharge was recorded. 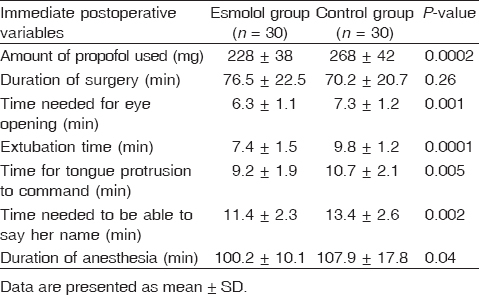 Compared with the control group, the esmolol group had following statistically significant results: lower blood pressure and heart rate, less fluctuant bispectral index values, lower amount of propofol infusion used, shorter times for immediate postoperative eye opening, extubation, tongue protrusion, and ability of the patient to mention her name, lower pain scores, fewer patients needed analgesics and earlier discharge from PACU. Intraoperative esmolol infusion is associated with hemodynamic stability and antinociceptive properties. Recovery profile was excellent and helped early discharge from PACU. Ambulatory surgery constitutes a special challenge for any anesthesiologist. A balance between deep levels of anesthesia during some intense situations of stimulation (e.g. during laryngoscopy, tracheal intubation, and peritoneal insufflation) and the need for rapid recovery and discharge is required without affecting patient's safety. Treating these situations with higher doses of opioids, inhalational anesthetics, or intravenous anesthetics, for example, propofol may affect postoperative recovery profile. Cardiovascular depression, respiratory depression, and delayed recovery may follow  . Esmolol, a short-acting b1 -adrenoceptor antagonist, has beneficial properties that make it a useful agent during ambulatory surgeries. It blunts hemodynamic responses to noxious stimuli and it has sparing effects on opioids , and on sevoflurane  . This study is a prospective randomized, double-blind controlled study designed to investigate the effect of intraoperative esmolol infusion on the recovery profile and discharge from postanesthesia care unit (PACU) in patients undergoing ambulatory laparoscopic gynecological procedures. After approval of Research Ethics Committee, written informed consents were obtained from 60 female patients scheduled for elective gynecologic laparoscopic surgery under general anesthesia. Patients were ASA physical status I or II. Procedures included laparoscopic myomectomy, tubal ligation, and ovarian cystectomy. Exclusion criteria included known adverse effects or hypersensitivity to esmolol, advanced cardiovascular, respiratory, neurological, hepatic, metabolic, or renal disease, asthma or reactive airway disease, or chronic hypertension. Obese (BMI > 30), breastfeeding, or patients on b-blockers, vasodilator medications, analgesics, or hypnotic medications were also excluded from the study. Patients were given either esmolol loading and maintenance doses (the esmolol group) or equivalent volume of normal saline (the control group). Randomization was performed by hospital pharmacy through a computer-generated sequence contained in sealed, opaque envelopes. Accordingly, two prefilled syringes (one 10-ml syringe for loading dose and one 20-ml syringe for maintenance does) were sent unidentified to operating room containing either esmolol (esmolol hydrochloride; Baxter Healthcare Corporation, Deerfield, Illinois, USA) 10 mg/ml or normal saline. The anesthesiologist and the nurse collecting data were not informed with the content of syringes. Loading dose was 0.1 ml/kg (equivalent to 1 mg/kg of esmolol) followed by maintenance dose of 0.18 ml/kg/h (equivalent to 30 mg/kg/min of esmolol). Loading dose was given after fentanyl injection and before propofol induction. Maintenance dose was continued until 'end of procedure' point that will be defined later. No premedication was given. On arrival to the operating room, patients were attached to monitors including ECG, pulse oximetry, blood pressure, and BIS monitor (monitor: BIS VISTA, sensor: BIS Quatro; Aspect Medical Systems, Natick, Massachusetts, USA). Anesthesia was induced by fentanyl (1 mg/kg) and propofol (2 mg/kg). Muscle relaxation was achieved by cisatracurium (0.15 mg/kg). After induction, capnography and nasopharyngeal temperature monitoring were added to monitors. Anesthesia was maintained by fixed-dose sevoflurane at 1% with N 2 O 65% in O 2 (approximately equivalent to 1 MAC sevoflurane in 65% N 2 O/35% O 2 for ages between 25 and 60 years according to official drug data). Depth of anesthesia was controlled with an infusion of propofol 1% that was started with a dose 25 mcg/kg/min and could be increased to keep BIS values between 40 and 60. No incremental doses of fentanyl or changes in sevoflurane were allowed to make propofol infusion the only changeable variant that controlled depth of anesthesia to allow a way to calculate differences in anesthetics consumed during the procedure. Muscle relaxant was used freely according to needs. Hemodynamic variables (heart rate, blood pressure, and oxygen saturation) and BIS values were recorded at these points: T1, before induction; T2, after induction and before tracheal intubation; T3, 1 min after tracheal intubation; T4, 5 min after tracheal intubation; T5, just before peritoneal insufflation; T6, after peritoneal insufflation; T7, during surgical procedure; T8, on skin closure; and T9, on eye opening. Blood pressure was maintained within 25% of the preinduction value. Hypotension was treated with increments of phenylephrine (Baxter Healthcare Corporation) 50 mg intravenous. Hypertension was treated with propofol increments if BIS values were increasing and with increments of hydralazine (Hydrapres; Laboratorios Rubio S.A., Barcelona, Spain) 0.1 mg/kg intravenous if not. Bradycardia was defined as heart rate below 50 bpm and was treated with atropine 0.5 mg intravenous. Intraperitoneal pressure was kept at a maximum of 15 mmHg and Trendelenburg position was used whenever asked by the gynecologist. The time of skin closure and wound coverage was marked as 'end of procedure'. At this time, esmolol and propofol infusions were stopped and sevoflurane vaporizer was turned off. Paracetamol (Perfalgan; Bristol-Myers Squibb, Anagni, Italy) 1 g, intravenous, was started. Times from 'end of procedure' to eye opening, tracheal extubation, tongue protrusion on command, and ability of the patient to mention her name were noted. Duration of surgery (from skin incision to 'end of procedure') and anesthesia (from induction to shifting the patient from operative table to PACU stretcher) was also noted. Total amount of propofol infused during maintenance of anesthesia was recorded. On arrival to PACU, postoperative pain was assessed using pain numerical rating scale (NRS). NRS is a 0-10 scale, where 0 = no pain and 10 = maximal pain imagined. Increments of 0.5 mg/kg of fentanyl were used when NRS exceeded 4. Times to first call for an analgesic and total amount of fentanyl used were recorded. The White-Song scoring system  was used to assess the recovery status. Patients who reached White-Song score of 12 plus NRS below 4 were discharged from PACU to Day-Procedure Unit. Time needed for PACU discharge was recorded. Sample size calculation : on the basis of White et al. 's  study, it could be hypothesized that recovery times would be reduced by 42-50% with the use of intraoperative esmolol infusion. Considering SDs in their study population, it is calculated that 28 patients in each group would be sufficient to give 80% power at a 5% significance level. Thirty patients were included in each group. Statistical analysis was performed using SPSS statistical package (version 20; SPSS Inc., Chicago, Illinois, USA) for Windows. Data were expressed as mean ± SD or median (interquartile range) for pain NRS. Unpaired Student t-tests were performed to determine differences between the groups except for pain NRS where the Mann-Whitney U-test was used. P-value of less than 0.05 was considered statistically significant. There were no statistically significant differences in demographic data between the two groups [Table 1]. No differences were found in arterial oxygen saturation readings between the two groups. Heart rate [Figure 1] and mean arterial blood pressure [Figure 2] were statistically lower in the esmolol group throughout the study. For BIS values [Figure 3], there were two points of statistically significant difference - 1 min after intubation and after peritoneal insufflation - with the control group showing the higher values. Figure 2: Mean arterial pressure changes throughout the study. T1, before induction; T2, after induction and before tracheal intubation; T3, 1 min after tracheal intubation; T4, 5 min after tracheal intubation; T5, just before peritoneal insufflation; T6, after peritoneal insufflation; T7, during surgical procedure; T8, on skin closure; T9, on eye opening. *P < 0.05, significant intergroup differences. Total amount of infused propofol was significantly higher in the control group [Table 2]. Duration of surgery showed no statistically significant difference. However, duration of anesthesia was significantly prolonged in the control group compared with the esmolol group. Variables concerning immediate recovery from anesthesia (times needed for eye opening, extubation, tongue protrusion, and ability of the patient to mention her name) were all significantly shorter in the esmolol group. Postoperative variables are listed in [Table 3]. Patients in the esmolol group have significantly lower pain scores. Patients in the control group asked for analgesics significantly earlier than in the esmolol group. They consumed significantly higher doses of fentanyl in PACU. 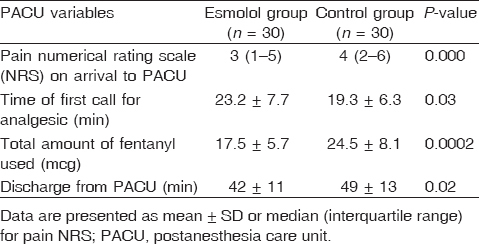 The esmolol group showed significantly shorter stay in PACU when compared with the control group. Safe and rapid discharge from PACU is an important goal postoperatively. To achieve this goal, efforts should be exerted from surgery and anesthesia teams. Many factors from the anesthesia side may delay discharge and even may lead to hospital admission. Beside medical comorbidity, postoperative nausea and vomiting (PONV) and postoperative pain are the most common causes of unplanned hospital admission  . Other factors include residual effects of anesthetics, opioids, or muscle relaxants, hemodynamic instability, and immediate postoperative respiratory complications. Tracing these factors and many more reveals that discharge from PACU starts with what happened in the operating room. In the present study, esmolol was used as an infusion throughout the anesthetic course, which affected many features perioperatively. Intraoperatively, it decreased the utilization of anesthetics, produced a state of stable hemodynamics, and stabilized BIS values. During the immediate postoperative period, esmolol enhanced all features of rapid recovery from anesthesia in the form of earlier eye opening, tracheal extubation, tongue protrusion, and ability of the patient to mention her name. Postoperatively, in the PACU, patients who received esmolol suffered less pain. The overall stay in PACU was shorter if esmolol was used intraoperatively. Depth of anesthesia was adjusted in the present study by utilizing a BIS monitor. Fixing readings of BIS values using variable rates of propofol infusion while fixing doses of other drugs that may affect the depth of anesthesia makes it feasible to measure and compare differences in depth of anesthesia between the two groups. In this way, the total amount of propofol infusion used during maintenance of anesthesia was a reflection of difference in anesthetics between groups. It was clear from results that the esmolol group consumed less anesthetics during the procedure. 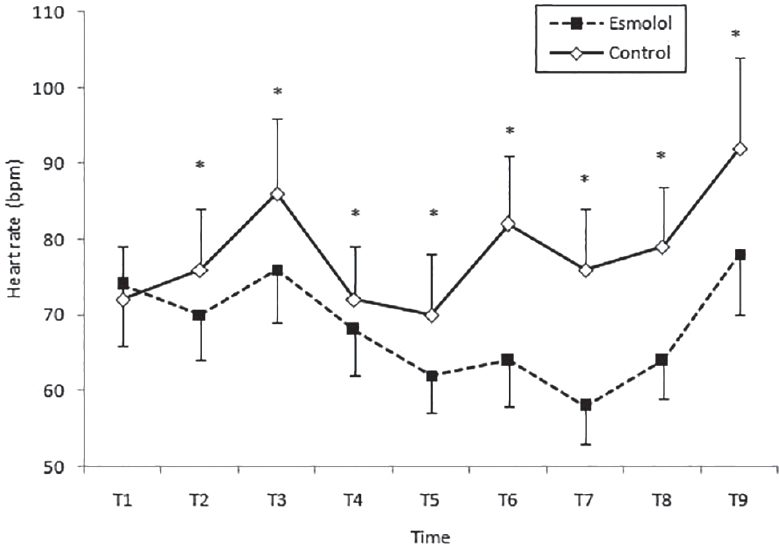 In addition, fluctuations in BIS values that occurred in the control group were blunted in the esmolol group. In the present study, there were two peaks in BIS readings in the control group: during intubation and during peritoneal insufflations. Both of them disappeared in the esmolol group. The effects of esmolol in stabilizing BIS during general anesthesia were proved in different studies. Esmolol was proved to have an opioid-sparing effect concerning hemodynamic  and BIS stability  . Menigaux et al. proved the efficacy of esmolol to prevent BIS-arousal reactions and to attenuate hemodynamic and somatic responses to laryngoscopy and orotracheal intubation. In the present study, the effects of esmolol on postoperative pain were clear. Esmolol infusion intraoperatively has led to lower pain scores on reaching PACU, longer time to ask for analgesics, and lower total amounts of fentanyl used in PACU compared with the control group. 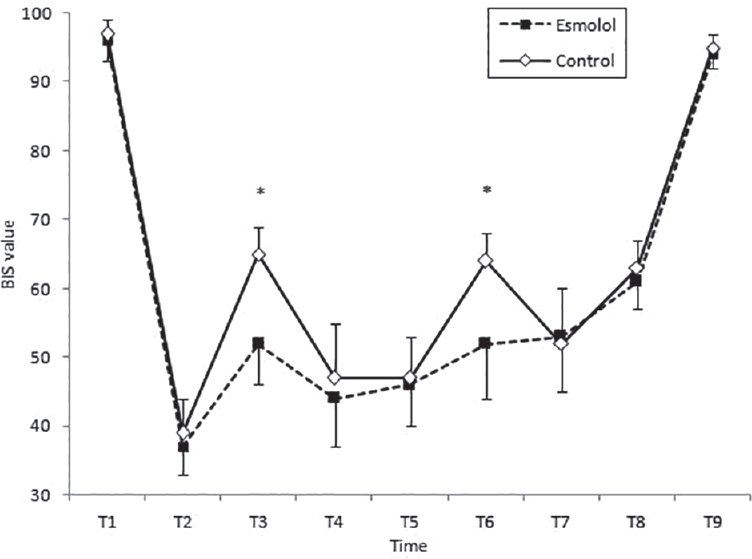 The effect of esmolol on pain was proved previously  . Even more, esmolol has been used to totally replace opioids intraoperatively with a significant decrease in postoperative use of fentanyl  . The effects of esmolol on BIS values, intraoperative anesthetics, and postoperative analgesics are all due to central antinociceptive effects produced by esmolol. These central antinociceptive effects of esmolol, which have been proven in animals as well  , are not well understood. One explanation is the presence of b-adrenoceptors in reticular activating system, and the use of b-adrenoceptor antagonists decreases electroencephalographic (EEG) indices of arousal  . However, esmolol, being a hydrophilic drug, is unlikely to have this effect. Another explanation is its effect on propofol  and fentanyl  pharmacokinetics, probably by reducing liver blood flow  . Esmolol was proved previously to have other important features that affect discharge from PACU. These include its ability to decrease the magnitude of core hypothermia  and its ability to decrease incidence of postoperative nausea and vomiting  . Consequently, it is not surprising that the esmolol group has higher White-Song score in a shorter duration, and therefore earlier discharge from PACU than the control group. In conclusion, intraoperative infusion of b-adrenergic receptor antagonist esmolol resulted in less intraoperative use of anesthetics and better postoperative recovery profile, and therefore early discharge from PACU. Further studies are needed to explore mechanisms behind these effects. Zhao SZ, Chung F, Hanna DB, Raymundo AL, Cheung RY, Chen C. Dose-response relationship between opioid use and adverse effects after ambulatory surgery. J Pain Symptom Manage 2004; 28:35-46. Coloma M, Chiu JW, White PF, Armbruster SC. The use of esmolol as an alternative to remifentanil during desflurane anesthesia for fast-track outpatient gynecologic laparoscopic surgery. Anesth Analg 2001; 92:352-357. Moon YE, Hwang WJ, Koh HJ, Min JY, Lee J. The sparing effect of low-dose esmolol on sevoflurane during laparoscopic gynaecological surgery. J Int Med Res 2011; 39:1861-1869. White PF, Song D. New criteria for fast-tracking after outpatient anesthesia: a comparison with the modified Aldrete's scoring system. Anesth Analg 1999; 88:1069-1072. White PF, Wang B, Tang J, Wender RH, Naruse R, Sloninsky A. The effect of intraoperative use of esmolol and nicardipine on recovery after ambulatory surgery. Anesth Analg 2003; 97:1633-1638. Smith I, Van Hemelrijck J, White PF. Efficacy of esmolol versus alfentanil as a supplement to propofol-nitrous oxide anesthesia. Anesth Analg 1991; 73:540-546. Menigaux C, Guignard B, Adam F, Sessler DI, Joly V, Chauvin M. Esmolol prevents movement and attenuates the BIS response to orotracheal intubation. Br J Anaesth 2002; 89:857-862. Davidson EM, Doursout MF, Szmuk P, Chelly JE. Antinociceptive and cardiovascular properties of esmolol following formalin injection in rats. Can J Anaesth 2001; 48:59-64. Johnson IA, Andrzejowski J, Sikiotis L. Arousal following isoprenaline. Anaesth Intensive Care 1999; 27:221. Avram MJ, Krejcie TC, Henthorn TK, Niemann CU. Beta-adrenergic blockade affects initial drug distribution due to decreased cardiac output and altered blood flow distribution. J Pharmacol Exp Ther 2004; 311:617-624. Wood AJ, Feely J. Pharmacokinetic drug interactions with propranolol. Clin Pharmacokinet 1983; 8:253-262. Inoue S, Abe R, Kawaguchi M, Kobayashi H, Furuya H. Beta blocker infusion decreases the magnitude of core hypothermia after anesthesia induction. Minerva Anestesiol 2010; 76:1002-1009. Lee SJ, Lee JN. 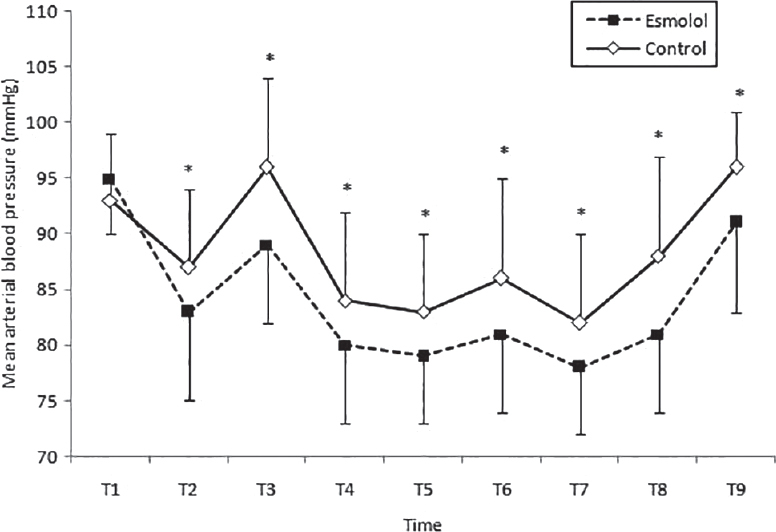 The effect of perioperative esmolol infusion on the postoperative nausea, vomiting and pain after laparoscopic appendectomy. Korean J Anesthesiol 2010; 59:179-184.